August 02, 2018, 3:30 p.m. Discovery Channel’s Shark Week continues to sink its teeth into captivated TV audiences. This year, the series marked its 30th anniversary by teaming up with celebrities like Guy Fieri, Mark Cuban, Shaquille O’Neal, Aaron Rodgers, and Ronda Rousey. 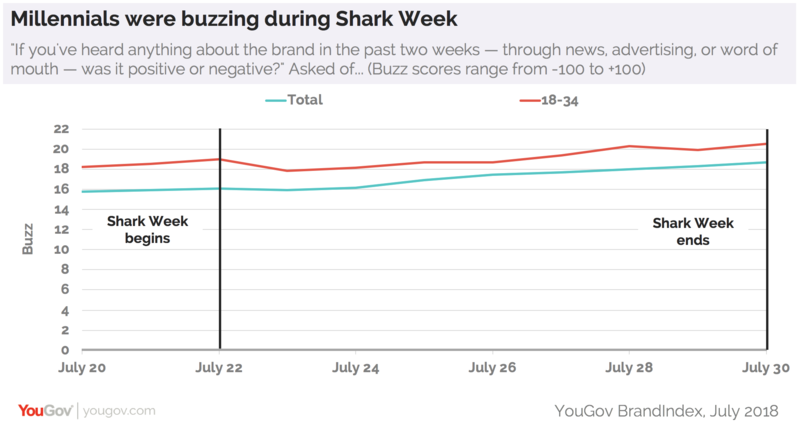 Shark Week’s 30th anniversary ran from July 22nd to July 30th and new data from YouGov BrandIndex shows that Discovery Channel’s Buzz score reached its highest mark so far this year at 19. A close look at those eight days reveals that the network’s Buzz score increased by at least 2 percentage points since July 22nd, the day the special aired. 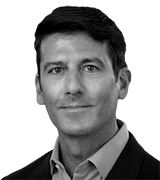 The program’s success is fueled in part by millennials. At the start of the special, the group was the most likely to say that they heard something about the network in the last two weeks, with a Buzz score of 17. By the end of Shark Week, the age group helped Discovery Channel’s Buzz score climb to 21. This may be the first year that Shark Week has a more lasting impact on Discovery Channel’s brand health. Data collected during the time of 2017’s and 2016’s Shark Weeks reveals that Discovery Channel’s marginal improvements in those years was followed by a period of normalization. This year’s Shark Week is both star-studded and big-toothed, an apparent formula for success. 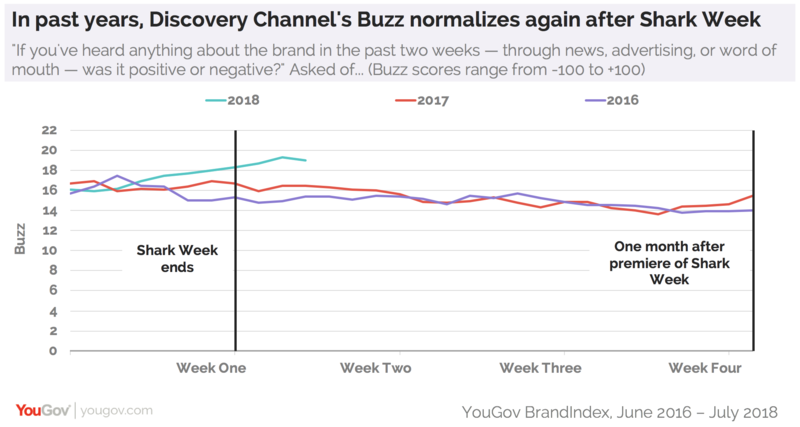 Not only is Discovery Channel’s Buzz score of 19 the highest it has hit during Shark Week in recent years, it marks Discovery Channel’s highest Buzz score in the last three years.